After watching The Force Awakens, I couldn't help but think it's a total remake of A New Hope given the amount of similar subplots. I've listed entire subplots of both movies that are identical in story (but not in realisation). Are there others? Which ones? An important message is given to a droid and the droid is sent on its own on a sand-planet to protect that message. The message is about something very important for both main factions of the galaxy and has to be delivered to the group later joined by the protagonist. The antagonist sends his troops after that droid. The protagonist is a 20-something year old living on a sand planet who rescues/retrieves that droid from scavengers. They find a rebel guy and get off the sand-planet with him (on the Falcon Millenium) after the situation has become unsustainable. In terms of objects, the protagonist acquires the lightsaber of the previous trilogy's protagonist and happens to be really good with spaceships. The antagonist answers to a bigger, shady villain. He has for home a planet-wide weapon made to destroy planets and is a real big deal there. The protagonist's group finishes its plan to destroy the planet-wide weapon and sends a X-Wings there to destroy its weak point. The antagonist kills his previous "figure of authority", furthermore in a situation that was provoked by that previous "figure of authority". The planet-wide weapon is destroyed just seconds before it can fire again, thanks to the protagonist's friends' best pilot. do not include specific or anecdotal scenes, cameos or nods. A group of innocent villagers—as a well as a tangentially connected protector/ally—are indiscriminately massacred by soldiers hunting for the lost droid. Remember how Jawas were killed and Uncle Ben and Aunt Beru were killed in Star Wars? Pretty much like that whole opening scene in The Force Awakens plot-wise. A key protagonist is rescued from imprisonment by someone unknown to the protagonist but sympathetic to their cause and is dressed as a Stormtrooper. In A New Hope Leia is rescued from the Death Star by Luke and Han (disguised as Stormtroopers) and Chewbacca (their supposed prisoner). Leia knows who Ben Kenobi is, but she doesn’t know who this “short” Stormtrooper (aka: Luke) is who breaks into her prison cell to rescue her but believes him and follows him. In The Force Awakens an actual Stormtrooper who is sick of what he does as a Stormtrooper decides to rescue a key Resistance pilot to escape the First Order. The Resistance pilot has no idea who this Stormtrooper is but follows him to escape. 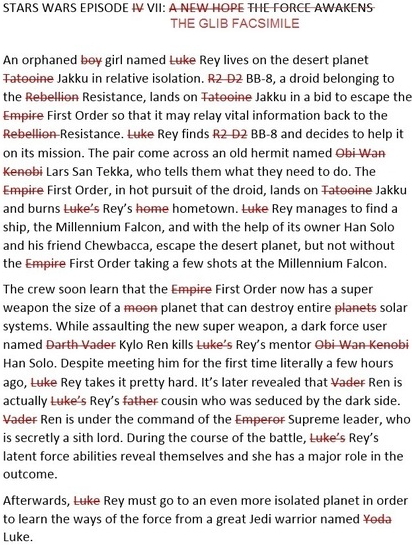 This also parallels the backstory of Luke’s friend Biggs Darklighter who leaves the Empire to join the Rebellion as well. And even Han Solo’s backstory as well. As explained here, Han was an Imperial Officer and he was ordered to kill Chewbacca—who was rescuing Wookie children destined to be used as slaves—but didn’t. The friendship helped convince Han Solo to leave the Imperial Navy and become a smuggler instead. In general, people discover new choices in life and decide to follow them. Luke discovers a whole new world via the droids and Ben Kenobi and the Rebellion. Finn decides he’s sick of the murder and bloodshed he sees and defects with the aid of a Resistance pilot. Rey and Finn meet up and discover their destinies are better off elsewhere with the help of a droid. Han Solo and Chewbacca in both films are smugglers who are in debt but then realize that helping their friends in the end is the best thing they can do. Not the answer you're looking for? Browse other questions tagged star-wars the-force-awakens a-new-hope .